Sister Marie of Tours: "Shelter France under the mystery of thy Face, and have mercy on her for the glory of thy Name." Many Catholics are unaware of the providential links between the beginnings of the public devotion to The Holy Face of Jesus (received by Sr. Mary of St. Peter of Tours [1816 -1848]) and the Church-approved apparition of the Blessed Virgin Mary at La Salette (1846). Both of these Heavenly manifestations also have ties with (arguably) the most important "seer of our times", Marie-Julie Jahenny (1850-1941) of La Fraudais. France, known as, "The Eldest Daughter of the Church" has a divine mission. Tragically, since the Judeo-Masonic French Revolution she has, in general, steadily declined from her once former exalted position. Nonetheless, God still calls His wayward Daughter to return at once, to His merciful embrace, to heal her mortal wounds ... she does not listen. Heaven has employed various supernatural means to reclaim its beloved France from this tragic course. In the book: "Life of Sister Mary St. Peter Carmelite of Tours", the direct connection of the Holy Face devotion, to the appearance of Our Lady at La Salette is shown - and their urgent message of Reparation to obtain His mercy. Here are select parts from Chapter XIV "La Salette" from the 480 page book: "Life of Sister Mary St. Peter Carmelite of Tours", 1884 Imprimatur. (Click to Download PDF of book). "... the servant of God (Sr. Marie de Saint-Pierre) had, some weeks previously, announced the apparition: of La Salette, and the merciful intervention of Mary in favor of France." "We here refer to the apparition of the Blessed Virgin at La Salette, on the 19th of September, 1846. Between this ever memorable event and the communications of Sr. St. Peter there exists a marvelous affinity, which, we must not fail to observe. The authority of Mr. Dupont (The Holy Man of Tours) in such a matter, is of the greatest importance; the account in detail which we have in his own words will serve to guide us. Before opening the subject, the pious narrator certified to the "truth" of his narrative, "in which" states he, "according to my poor conception, we may behold a prophetic announcement of the glorious event which took place at La Salette." "In 1846, toward the beginning of the month of September, on the eve of departure for St. Servan, in Brittany, I went to receive the commissions of the reverend mother, who had some relatives at St. Malo." "I was obliged to write a long list, so numerous were the commissions given me, and in the meantime, we entertained ourselves on the divine mission of Sister St. Peter." "I shall relate to you what she (Sr. St. Peter) has just told me, said the reverend mother, and as I had a pencil in hand I wrote as follows: "Our Lord addressing himself to the sister said: My Mother has spoken to men of my displeasure; she desires to disarm my justice and she has shown me her maternal heart, saying: my Divine Son, behold this heart which has so loved thee! Let me shower benedictions on my other children! After which she descended to the earth. (Emphasis added by TCW) Have confidence in her. I placed these lines in my prayerbook, and thought no more about them. "Was I not in the presence of a mysterious language, in which the past was confounded with the present and the future!" M. Dupont concludes, that the servant of God had, some weeks previously, announced the apparition: of La Salette, and the merciful intervention of Mary in favor of France. "... The mother prioress looked upon this event as a wonderful and striking proof of the celebrity which was one day to be given to the Work of Reparation claimed by Sister St. Peter in the Name of God. The mission confided to the little shepherds of the mountain was evidently identical with that of the cloistered virgin of Carmel. Another circumstance made known after ward to M. Dupont, and not unworthy our notice, is that long before these events took place, the pious sister had herself ardently solicited the intervention of the Blessed Virgin. Let her relate the fact herself: "Monseigneur would not take any decided step to forward this work; his prudence preventing him taking the initiative. I saw quite plainly that there was neither hope nor consolation for me but in prayer, and the intercession of Mary, our most powerful advocate; and I recited the rosary every day to obtain grace for France, and also the establishment of the Reparation in all the cities of the kingdom. All my prayers, all my communions, all my aspirations and all my thoughts were offered for the establishment of this work, so dear to my heart. I desired, if it were possible, to proclaim it all over France, by making known to my countrymen the misfortunes which menaced them. Oh! how I suffer in being the only confident in a matter of such importance, and which I am obliged to keep secret within the walls of the cloister! Oh most Holy Virgin! I implore you to come to some pious soul in the -world, and make her a partaker of that which has been communicated to me in reference to France!" infantine mouths, the Blessed Virgin has rebuked her people, as she lovingly styles France, her cherished kingdom, reproaching them for their impiety, so openly manifested by their contempt of the commandments of God, notably by blasphemy and the profanation of the Sunday. "If my people will not submit," said she, "I shall be forced to let fall the avenging arm of my Son; He is so justly irritated that I can with difficulty restrain his anger. Oh! if you knew how much I suffer for you! 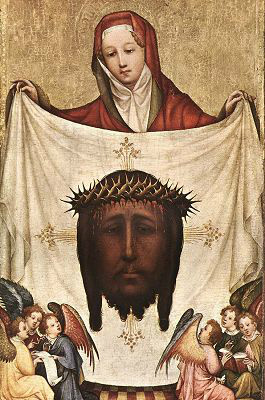 And the tears streamed from her eyes; the image of the crucifix was on her heart; the instruments of the Passion, the hammer and the nails on either side, lay on her breast. The two shepherds related what they had heard and seen; they underwent cross-questioning and contradiction, but their message become known, and gave to the Christian world an impulse which has not since ceased. In vain have the powers of earth endeavoured to place obstacles in the way of the apparition becoming known, they but confirmed the testimony of the children; Catholic France recognized her crime and feared the chastisement; she has entered on the path of reparation. Our seraphic little Sr. St. Peter intones a hymn of gratitude and joy on this occasion: "I render thee thanks, divine Mother! for having given me these two little shepherds as sounding trumpets, to cause the mountains to re-echo in the ears of France, that which was made known to me in solitude. The voices of my two little associates were soon heard all over the earth, and their announcements produced a great impression on mankind. The striking relationship between their communication and those which I have received, leads my superiors to think that it might be useful to give information of the fact for the glory of God and the advancement of his work. Our Lord in the Grospel has said: Blessed be thou, Father, because thou hast concealed these things from the great and wise of this world and hast revealed them to little ones.'" " ... let not our confidence be presumptuous. Let us pray earnestly, and weep over our sins; for a time will come, not far off in the future, when France will be shaken even to her very foundations. Then shall she tremble, but she shall not be overwhelmed if the Work of Reparation appear before the eyes of the Lord in every city of the kingdom; those now marked out to be reduced to ashes will be but slightly injured." Sister Mary of St. Peter is mentioned also in the revelations of Marie-Julie Jahenny of La Fraudais, in a most important of matters. It was revealed to her by Heaven the exact date of A Warning which will come immedietely before the 3 Days of Darkness Chastisement. Jesus: “ . . . I forewarn you that a day will be found and it is already appointed when there will be little sun, few stars, and no light to take a step outside of your homes, the refuges of My people. The days will be beginning to increase (days get longer on Dec 22). It will not be at the height of summer nor during the longer days of the year (summer time), but when the days are still short (winter time). It will not be at the end of the year, but during the first months (of the year) that I shall give My clear warnings. That day of darkness and lightning will be the first that I shall send to convert the impious, and to see if a great number will return to Me, before the Great Storm (Chastisement) which will closely follow. (The darkness and lightning of) that day will not cover all of France, but a part of Brittany will be tried by it. (However) on the side on which is found the land of the mother of My Immaculate Mother (the land of St. Anne) will not be covered by darkness to come, up to your place (home of Marie-Julie) . . . All the rest will be in the most terrible fright. From one night to the next — one complete day —, the thunder will not cease to rumble. The fire from the lightnings will do a lot of damage, even in the closed homes where someone will be living in sin. My children, that first day (of chastisement) will not take away anything from the three others (the 3-Day Chastisement) already pointed out and described. Hello. I am an American citizen that currently lives and works in Asia. Are there any regions with valid priests? Thank-you. Hi Eric, yes there are. The PRC will email you with more info. Hi and thanks for your inquiry. The PRC will have someone contact you (privately), shortly. My wife and I live in Mesa, AZ. Where can we go in So. Calif. to have censures removed and receive the sacraments from a Pope Gregory priest? Hi. At times Masses are available in SoCal. Yet, your best chance is to come to larger type meetings, which are being planned for this year. Contact TCW staff for further info. Hi, think I asked this on another thread, but not sure about which one. May I ask about Christmas Day gathering and gathering early in year? Will email too. Any priests in WVA, Oh, or Ky? Currently near your state (in the Carolinas) on and off. If the faithful give consistently, we could have a permanent priest in that region. Tithing is not an option, but a duty.